Fish a mountain lake right, and you'll discover an addictive angle on bass fishing. Clear water, light lines, unexpected fish behavior and unusual water character combine for magic moments. While the spectacular scenery of the Blue Ridge Mountains drapes the horizon, a leaping smallmouth bass showers the lake's surface. Feisty spotted bass bore deep into the depths. Largemouths rattle a laydown. 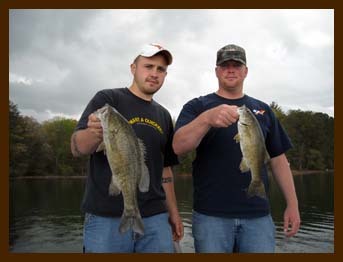 Georgia's scenic gem, Lake Blue Ridge's bass fishery is dominated by smallmouth bass. Catch 10 bass here and eight are sure to be smallies on this run-of-the-river impoundment that stands on the city limits of Blue Ridge, Georgia. Rocky cover, laydowns and boat docks abound where largemouths, smallmouths and spotted bass forage in water deep and shallow, depending on the season. Individual fish average about 2 pounds in weight, but hang onto your rod! Your next hook-up could be a 5-pound beauty! Nestled in a valley rimmed with high mountain peaks that spread across the Georgia-North Carolina border, the finger coves and long gravel points of Lake Chatuge offer challenging sites for hooking into the feisty spotted bass. Largemouths and smallmouths have their place here, where this TVA lake wraps itself around the community of Hiawassee, Georgia, but it's the spotted bass -- and lots of them! -- that's king of the reservoir. Arguably, the most beautiful lake of the Blue Ridge Mountains, Lake Nantahala sits off the beaten path of many bass fishermen. But the bassin' gang in the southern Appalachians know the 2700-acre reservoir that feeds one of the region's finest trout fisheries carries a good reputation for it's smallmouth bass fishing. Deep, rocky, full of forage and clear as an aquarium, Lake Nantahala is an ideal environment for growing smallmouth bass (and walleyes, too!) that surprise anglers in both size and strength. Top baits include deep-diving crankbaits and a variety of jigs. Always be on the ready when pulling your favorite bass lure through the depths of Lake Nantahala. It's not unusual for their heavyweight cousins -- the largemouths in the lake -- to swipe your favorite lure away from the maws of a feisty smallmouth. 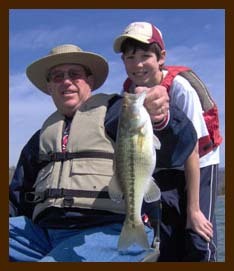 NOTE: Most pricing for trips offered are based on one or two anglers per trip. Additional anglers can be accommodated on a per angler basis and may require additional guides/boats. Large parties can be accommodated with customized trip packages. Fishing accessories and initial fly selections (recommendations available) -- such as waders, wading boots, caps, sunscreen, insect repellent, etc. -- are not provided. Additional flies provided by guides at no cost. 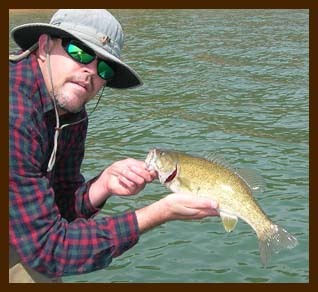 Fishing licenses are required for all waters and are the responsibility of each angler. Prices are subject to change.